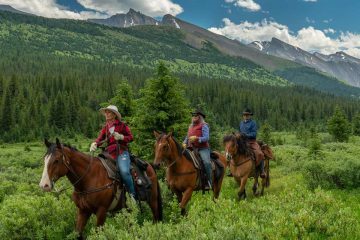 Want to experience the unspoiled wilderness of Banff on horseback, but don’t have a lot of time to do it in? Then this 2-day overnight trip is perfect for you. Meander along a trail that takes you to the tranquil Bow River. Relax and enjoy a cowboy coffee by campfire along the way before arriving at Sundance Lodge, secluded but just 16 kilometres (10 miles) from town. At night, relax on the porch or linger near the crackling fireplace and watch the starry night. The Sundance Overnight trip for perfect for ages, families or groups of friends because anyone can do it. Plus, the journey overall is surprisingly comfortable. We’ll begin the trip by meeting at Warner Stables at 9:30am for your ride and checking in at the office in the east barn (please do not arrive any earlier than 9:30am). There’s plenty of free parking at the stables and you’re welcome to leave your vehicle here during the trip. After you’re all checked in, we’ll hand out your slickers and saddle bags and introduce you to the horse that we have specifically picked just for you. Things happen on “Western Time” here so we may not leave right on the dot and you’ll have time to get to know your horse and ask any questions. One of the aspects of these tours that guests often rave about is the connection they forge with their hooved companions. At the end of the trip, you’ll have a new four legged best friend. Our horses are steady, responsive and can be counted on to cross any terrain, from forest paths to boulder-strewn creeks. Never been horseback riding before? Don’t worry. We will match you with a mild-mannered horse and teach you everything you need to know. You’ll be surprised at how quickly you gain confidence in the saddle, learn to trust your horse and go from greenhorn to cowboy. On this backcountry adventure, we’ll take you along a route that the early explorers of the Canadian Rockies blazed nearly a century ago. It’s the ideal way to dip your toe into horseback trekking in Banff, even if you don’t have a lot of time. Saddled up and ready to ride, we’ll hit the trail for the ten mile journey to Sundance Lodge. We will follow the trail alongside the rushing glacier-fed waters of the Bow River, Healy Creek and Brewster Creek. Along the way we’ll stop for a simple, hearty cowboy-style hot lunch on the banks of the river. Settle into your room and freshen up from your day on the trail, then gather around the table for a gourmet meal and an evening of conversation. By the end of this trip, you’ll have plenty of new friends from around the world. After a deep and restful sleep in the peaceful quiet of the backcountry, you’ll awake to a hearty breakfast and a steaming mug of coffee. With no emails to answer or errands to run, your time is your own. You can sit on the deck, get lost in the pages of a good book, have a chat with your horse or get to know your fellow adventurers. We will begin our ride back to Banff in the late morning. You’ll bring along handmade sandwiches for the journey, as well as fresh-baked goodies and fruit. You’ll return to Warner Stables at approximately 4:30 pm, with plenty of stories to tell about your adventure in the backcountry. The two-day tour commences at 9:30am at the Warner Stables on Saturdays, with two full days of riding (approximately 5-6 hours per day including leisurely breaks). The ride returns to the stables at 4:30pm the following day. The tour includes overnight accommodation at Sundance Lodge, dinner, breakfast and a packed trail lunch for each day. All bedding is provided.